Looking for a fun, meaningful Mother’s Day gift for Grandma that you can make with your child? All you need to do is collect some objects from around the house that symbolize Grandma’s interests and follow these steps to make a unique relief sculpture! It looks terrific and is lots of fun for little ones to design! Okay – to get started – explain to your kiddo that you’re going to make Grandma a gift out of plaster and need to collect some things around the house that represent her. Go on a hunt! This part is really fun! To make his Oma‘s sculpture, my son and I raided the kitchen! Oma is a terrific cook who regularly stocks our freezer with delicious homemade dinners – so we went with a utensil theme! Here’s what we collected. 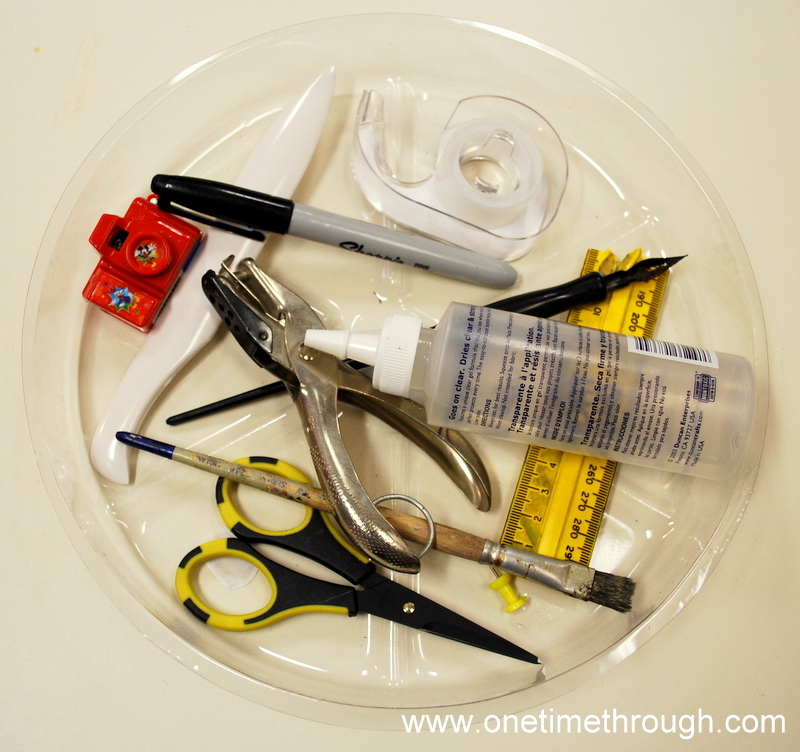 We actually ended up using some of Onetime’s play-kitchen utensils too because they were nice and small! To make his Nan‘s sculpture, my son and I looked for crafty items that would make interesting prints. Nan is an amazing calligrapher and an avid scrapbooker – so we found lots of crafty tools to use! 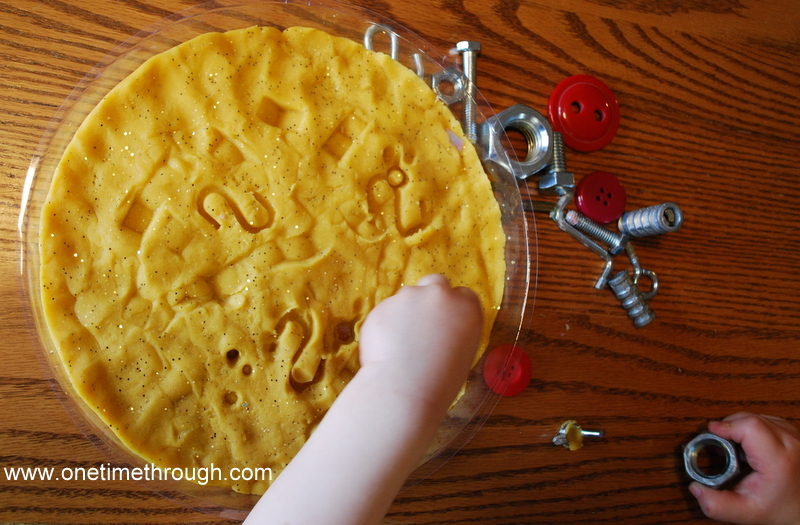 Once we had gathered all the “things” to symbolize the Grandmas – I showed my son an example of a finished sculpture so he would know that we were making a mold with the playdough and not just sticking stuff in! You could always just share some of the pictures in this post with your child. To start, we decided what containers we were going to use for each Grandma’s art. We chose a circular plastic plant drip catcher for Nan and a rectangular box for Oma. Then we laid the items inside each to make sure they would fit well. 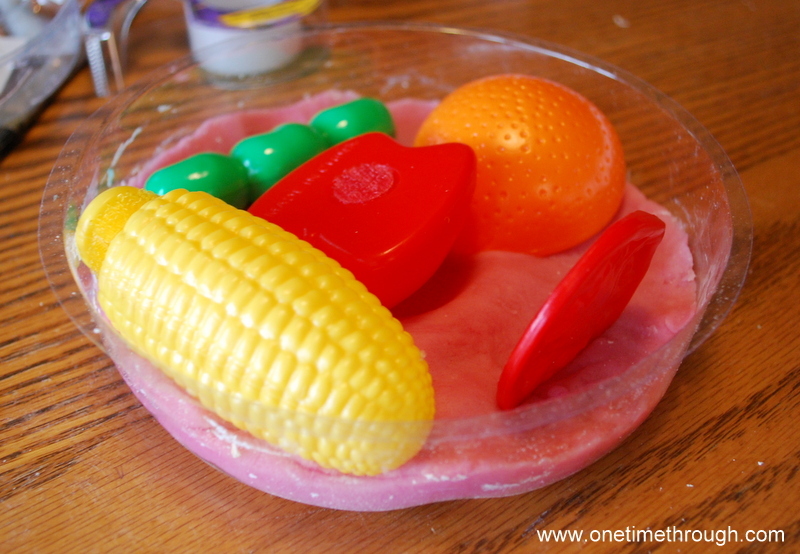 Next, Onetime pressed playdough into the bottom of each container. 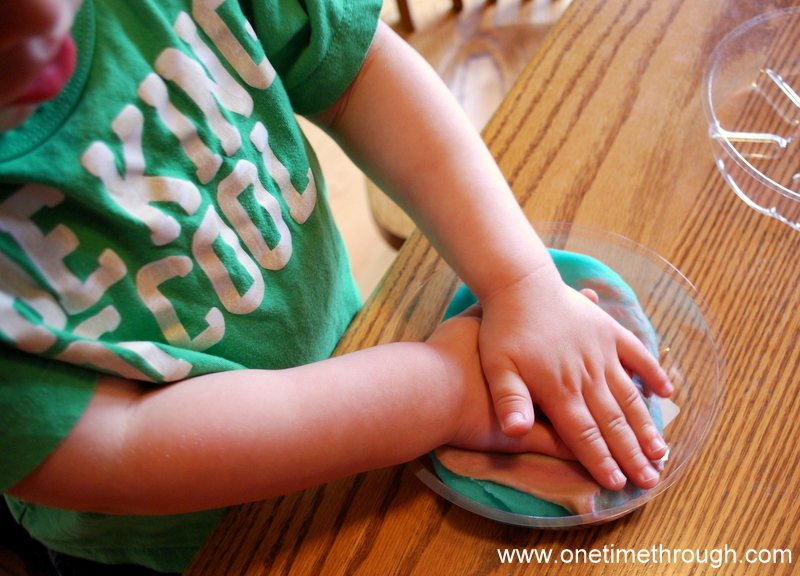 This playdough was leftover and homemade, but you could also make up a batch if you need some. Find my awesome homemade recipe here. OR, you can just use wet sand if you don’t mind a little more mess. Make sure the playdough is pressed evenly throughout the container to about 1″ thick (ditto for sand). Also, smooth out the surface with your fingers before continuing. Now it’s time to make imprints of all those collected objects! Besides making a plaque for his Grandmas, Onetime also wanted to make one up for Daddy with nuts and bolts and another one with play food! My son LOVED this part! At first I had to show him how we were pressing the objects in about 3/4″ to get their imprint, then taking them out again. Soon, he got the idea and continued independently. If you use sand, make sure it is wet enough that the objects leave a nice clear print when removed. 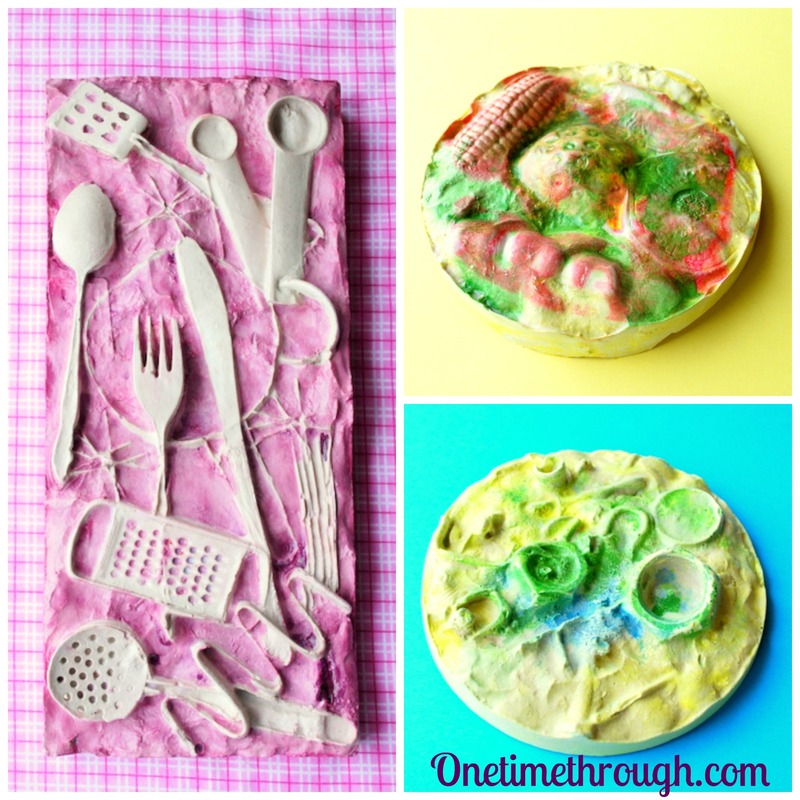 Once the playdough is completely imprinted and designed – it’s time to pour in the Plaster of Paris or craft cement/plaster. If you decide to go with the Plaster of Paris – please read the instructions carefully – there are some safety precautions you need to take, and you will need to do this part without your children around. I chose to work in the garage after my son was asleep, so that I could focus on using the plaster safely. 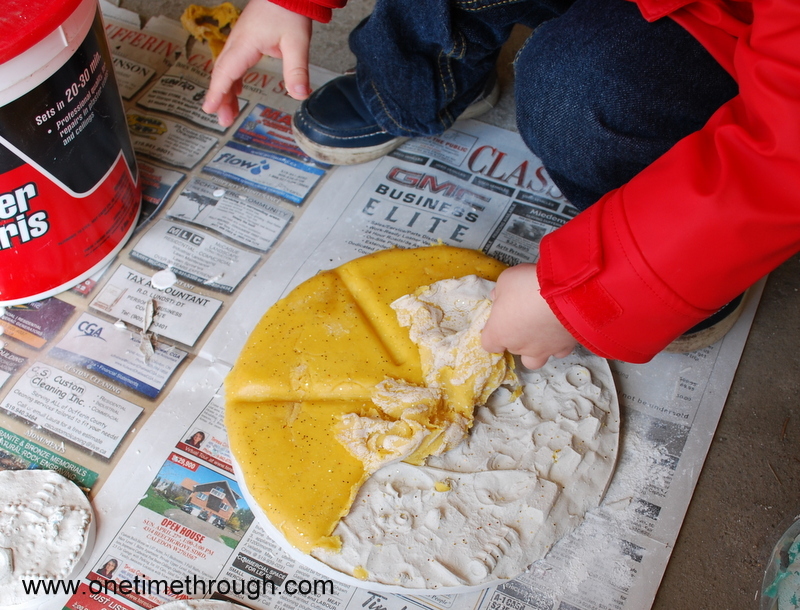 Pour the wet Plaster of Paris onto the top of your playdough mold until it is at least 3/4″ thick. Let it dry overnight. It’s time for the big reveal! If you want your child to participate in removing the playdough mold to get the first glimpse of the sculpture, I would recommend they wear gloves of some kind (and yourself too). Because the playdough is damp, the top of the plaque as you peel it away will be a little damp too, and you don’t want to get the wet plaster on your skin – it can be an irritant until it is dry. We realized this a little late and then washed,washed, washed! (Onetime was totally fine – I just got a bit paranoid when I realized the plaster was still a bit moist!) Anyway – GLOVES! Enough said. There are lots of different ways you can paint the sculpture, but we stuck with watercolours. I squirted a bit of the watercolour paint into small glass containers, added water and then shook them up! Voila – watercolours ready to go! (Thanks to my artist friend, Jen at 4MonkeysStudio for that idea!) If you use water-tight lids, you can keep these paints to use over and over! Experiment with different ways to paint the plaques. Onetime did a few plaques painting the entire surface in different colours – which look fun! We also painted some of them just on the spaces around the imprints – which creates a totally different look. When the paint is dry, cover the entire surface of the plaque with a glossy sealer like Mod Podge. Although this project takes some time, my son really enjoyed designing and painting the plaques. I think they look terrific and I’m sure the Grandmas will love their personalized gifts this year along with the “love letters” that we did earlier this week! Check out our Mother’s Day Pinterest board for other great ideas! Follow One Time Through’s board Mother’s Day Gifts and Ideas on Pinterest. This is the coolest thing!!! What a great idea! A really interesting process for kids and a meaningful gift – genius!